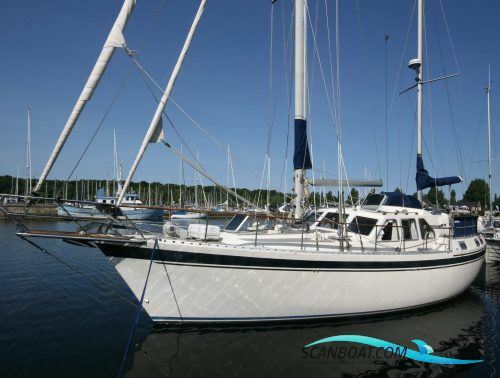 Ketch rigget, Nauticat 40. Vibrant luxury villa with plenty of space for the big family. It's about 103,4 m 2 total sail area, distributed on Genoa and Jib, both on roll, the big sail rolled into the mast. In addition, the mesan. Genoa and the big sail trimmed from the aft deck / cockpit, Jib was shot on a self-loading rail mounted in front of the mast and the mesan from the railing behind. With jib and mesan sat, there is balance in the boat and it is only the people who set the limit in how hard weather you are sailing. A super solid built, stable and enjoyable boat. The cabin in front consists of 2 beds that can be converted to a double-bed, as well as one bed above. Midship toilet with hand shower. On the starboard side there is a U-sofa with seating for 4-5 people, the table can be converted into a double bed, opposite side there is a L-pantry with a refrigerator in the table, a stove with 3 gas blocs and a gas stove. Steering wheelhouse has steering in starboard side, opposite side large U-sofa with seating for 7-8 people around a table with pull-out. Afterwards we have owners cabin with double bed, there is a cabin with 2 beds and a toilet with good and functionelt shower. Sleeps 9 can sleep well. Hot and cold water everywhere, big water tanks 2 pcs each 400 ltr, heat and ventilation on diesel from the tanks. 2 peaces diesel tanks each 400 ltr During the last 4-5 years, various hoses and straps have been replaced, with larger bow thruster remote controlled. Gear and cabling, crutch, starter, heater and much much more. It is a 4-cylinder power engine that still spins like a sewing machine. The hull itself is coated with copper, so osmosis will be non-existent. Everywhere lots of drawers, cabinets and stow away space. There are no limits to what a Nauticat may contain.